Former world middleweight king Gennady Golovkin has, as fans know, signed a big, six-fight deal with DAZN yet, despite an official presser to make the deal legit, the identity of Golovkin’s next opponent, the man who will be facing him in his DAZN debut, remains a mystery. There are, however, plenty of people in the know suggesting the identity of the opponent will soon enough be revealed as Poland’s Kamil Szeremeta. Having signed such a big deal, it was felt by many that Golovkin would not face anyone too tough or dangerous in his DAZN debut (it was the same way with Canelo Alvarez, who was afforded an easy and straightforward “world” title fight, up at 168 pounds against a game but outclassed Rocky Fielding, in his DAZN debut back in December) – and in this regard, the unbeaten but largely untested and unknown Szeremeta fits the bill perfectly. It could of course turn out to be someone else in the opposite corner in May or June, when GGG is expected to fight, but it will be no shock if it does indeed turn out to be the 29 year old Pole. Perfect at 19-0(4), Szeremeta is the European middleweight champion and he last fought just this month, on the 9,th when he decisioned Frenchman Andrew Francillette. The most instantly notable thing about Szeremeta’s record is his lowly number of KO or stoppage wins – just four. 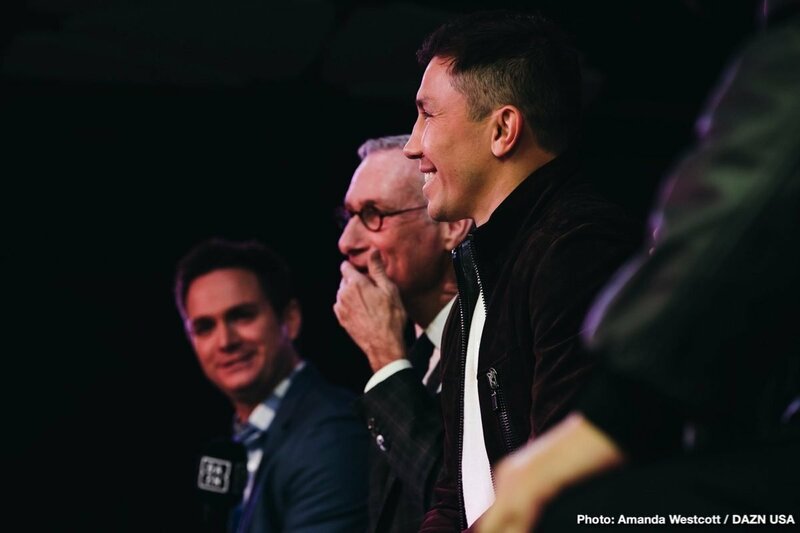 Golovkin, with his granite chin, doesn’t seem to have a thing to worry about in terms of his opponent’s punching power if it turns out to be Szeremeta next, so that leave boxing skills – can the 29 year old outbox GGG? Szeremata is a good boxer, with fast hands and a clever defence, but he will really have to box out of his skin if he’s to cause the big, big shock (it would almost certainly prove to be the Upset of The Year if Szeremeta did tackle Triple-G and somehow managed to defeat him). Szeremeta has good wins on his record, over useful fighters such as Kassim Ouma, Patrick Mendy, Arthur Hermann and Ruben Diaz, but he will be taking one massive step up in quality of opposition if he does face Golovkin. Some fans may well grumble if it does turn out to be Szeremeta next for GGG, but rest assured, the big fights will come in time. DAZN will have it no other way. Canelo/GGG III this year, perhaps?